My dear friend Colleen Crowley has been lending me her wonderful cabin here in Vienna, Maine while I get ready for what my new life is going to look like and it’s fabulous! No electricity or running water, but HUGE windows, the comfiest bed with flannel sheets and a down comforter, and a Coleman stove. Okay, and I have to tell you about the composting toilet. It is the coolest thing ever, doesn’t smell a bit, and uses NO water. Everyone should have one. Really. I’ve fallen in love with candles and all of the (Virgin) Mary artwork that Colleen has all over the cabin. 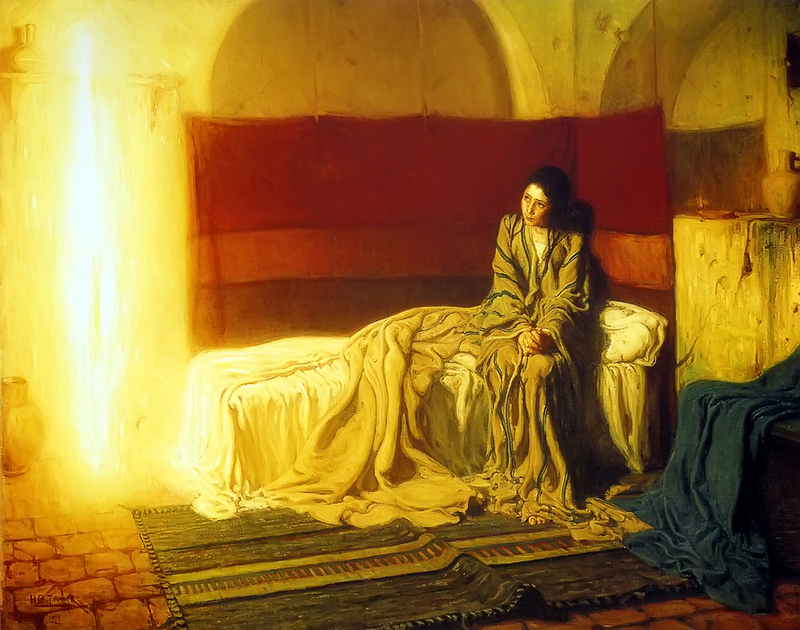 I want this print called “The Annunciation” by Henry Ossawa Tanner SO MUCH. I look at it every morning and at the other lovely Mary images and artifacts that imbue this exquisite little place. I’ll have more pictures to share when I return, but just wanted to say that in return for Colleen’s kindness in letting me stay in her cabin, I will be doing a free writing workshop at the Dr. Shaw Library in Vienna, Maine this Sunday, March 24 from 3:30-5:30 so if you’re in the area, come on by. The librarians are super nice and the theme is going to be Self-Compassion. Mostly though, we’re just going to talk about writing, journaling, poetry, and how amazing it all is. Love to all of you, and thank you from the bottom of my heart for all of the kind wishes. They mean the world and more. I love you all too. What an image you paint. NOW (since I’ve learned of the composting toilet) you HAVE to read “Drinking the Rain”:). Thanks for posting. Your Self-compassion topic is inspired. Good luck with the writing workshop. Always in my thoughts and prayers, Leslie. We love you very much and hope you are as warm in your cabin as you are in our hearts ! what a wonderful retreat! Would be lovely to attend your workshop but Maine is so far from IL. I’ll be back, Linda, and will be offering workshops in IL throughout the summer!